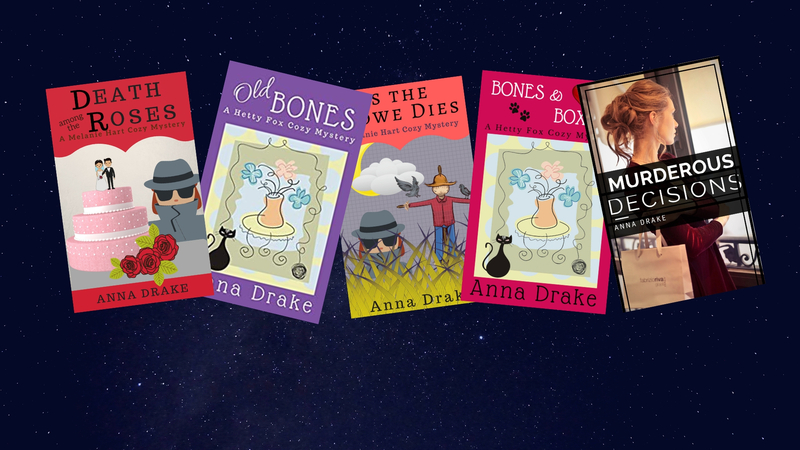 Hi, I’m mystery writer, Anna Drake. Welcome to my home on the Web. I write two cozy mystery series. So far, these books have only been available at Amazon. I’m beginning, though, to transition to a wider audience. A Rainy Day Murder is the first book in wide distribution, and I just added Bones & Boxes. It’s currently in the midst of being distributed for Nooks, and iBooks, and other outlets..
Melanie Hart is a small-town journalist who works for her father’s downstate Illinois newspaper. It’s located a quiet little town and is a quiet little newspaper until murder comes their way. Melanie’s journey into sleuthing begins when an old friend is murdered. Sidekick, Ginger Black, doubts the local police chief knows their circle of friends well enough to unearth the killer. She suggests they team up to help the local cop track the murderer down. Melanie isn’t so sure that’s a good idea. But when Melanie’s pulled off coverage of the only murder investigation to come along in Cloverton since she started work there, she’s more than a little upset. Suddenly, Ginger’s idea to join in the hunt for the killer makes perfect sense. So begins the first in a string of murders the pair set out to solve. Buy for Kindle. Releases coming soon for Nook, iBooks, Kobo, and more. Check out additional Melanie Hart mystery books here. Facing a ghost, a dead body, and a cat, Hetty Fox has her hands full. Recently widowed and new to to town, she also must find her place among a village of strangers. That effort is how she discovers her second dead body. It also launches her into her first murder investigation. Book 1: Bones & Boxes. Read an excerpt. Buy the ebook from any of the following retailers. Explore more Hetty Fox mysteries.